Aimed largely at florists wanting to learn a considered, painterly way of working, without the use of floral foam. You will learn to design and create small and intricate centrepieces as well as large, dramatic installation pieces. 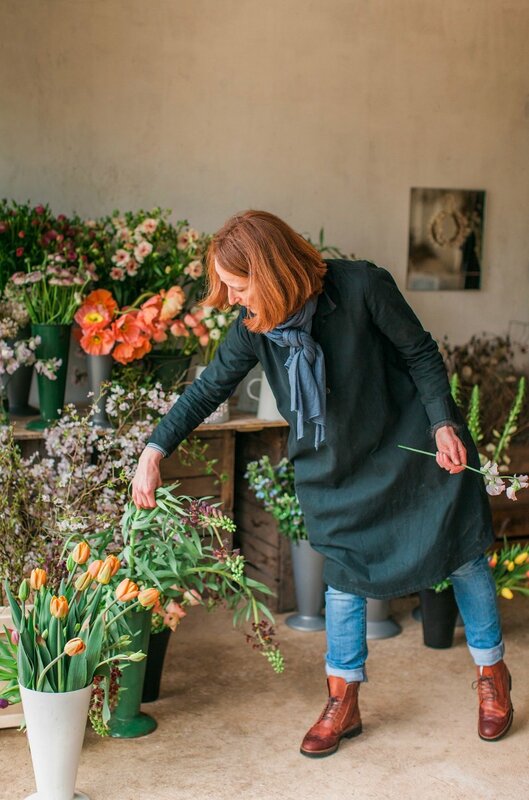 Also suitable for other creatives wanting to have a day learning about and working with flowers, in an inspiring environment with lovely people. Abbey Hall, Hoxne Road, Eye, Suffolk IP23 7NJ. 'Painting with flowers’. ‘Pieces of art’. ‘Little masterpieces’ . These are all phrases that have been used to describe the work of Fiona Pickles of Firenza Flowers and Brigitte Girling of Moss & Stone. Fiona and Brigitte are going to share the secrets of their way of working - this is your opportunity to learn from both Brigitte and Fiona by day, then join them for a candlelit supper, amongst the array of creations you created, by night. A full day of learning with plenty of fun and laughter as well and special, seasonal food. In the morning, you will learn how to design a slow, delicate and considered piece of art for a centrepiece. After a picnic lunch outside on blankets you will master a host of techniques for creating large installations, all painterly and all foam free. The space has endless possibilities for various types and designs of installation, all of which will require different techniques and thought processes, which you will get to be part of and work through together. Everything will be created without the use of floral foam so this is perfect chance to learn a variety of techniques, or to build on those you already adopt. Fiona and Brigitte will work with you as a group and you will get to benefit from their past experiences of working in different and often challenging environments. Situated in an idyllic location the heart of rural Suffolk, amongst stunning water meadows and overlooking the local church, it is located on the site of the former Benedictine Priory of St Peter built in 1011. The Barn was originally used as a working dairy, then a livestock farm before falling into disuse. It is now a magical space for events and exhibitions. The amazing Holly from Belle and Beau will be taking pictures throughout the day. This class has been a long time in the planning and one that Brigitte and Fiona are both very excited about. Demand is expected to be high, so don’t hesitate, sign up now and join them for a wonderful and unique experience. Payment is required in full due to imminent date. This is NON REFUNDABLE, even if the place is subsequently filled so please ensure you are definitely able to attend prior to booking. All food and drink throughout the day is included. Tools, equipment and flowers will be provided. You get to take home your centrepiece (after Supper) as well as a lovely gift. We recommend you stay locally to get the full benefit- accommodation is NOT included.